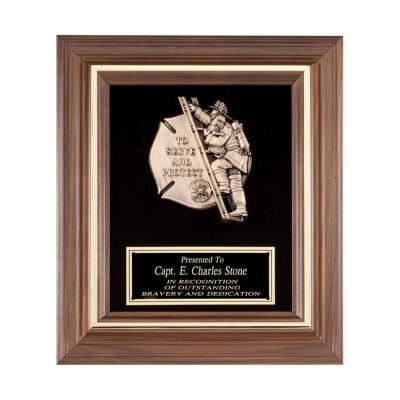 Give honor to those who serve and protect with this Serve and Protect Fireman with Gold Trim Plaque Award. This is an 11” wide x 13” tall walnut plaque featuring gold trim. The bronze casting of a fireman with child has lettering that states “To Serve and Protect” and is mounted on a velour background. The matching nameplate can contain your basic artwork and text imprinted in gold to match this award, for a truly classy look. Price includes item, nameplate and basic artwork and text.